Am. Can. Ch. Falconeers Flying Dutchman, C.D. Painting watercolour done by my mother after Dutch passing. I bought "Dutch" when I was working in the USA. I was and I'm still a fan of his great-grand father "Kiwi" (Int'l.Dan.Bel.Swed.Finn.Ch. So Proudly We Hail du Sac a Malices). So when I learned that Lesley Potts (Dutch's breeder) was selling a Kiwi's great-grand son, I bought him without any hesitation!!! 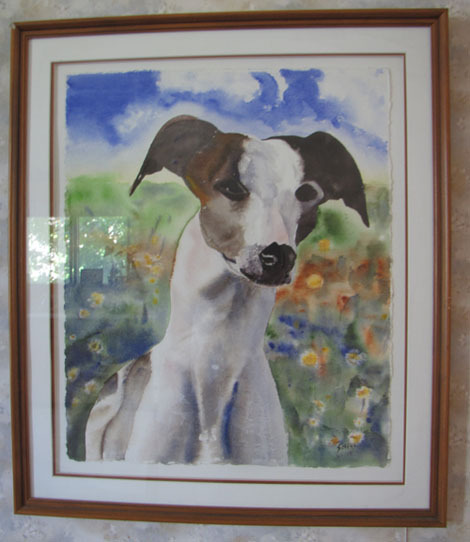 Dutch had the whippet type I always admired!!! He had that kind of body and lines, that elegant strongness that appealed me a lot. Dutch was really a stallion of a dog!!! 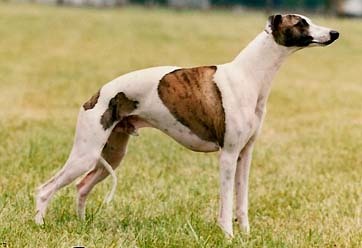 Dutch's temperament is my inspiration in breeding whippets. He had a royal aura around him. Even non-doggy people would say "He stands like a prince!". Dutch was the center of attention where ever we would go. His dignity made everybody fall in love with the whippet breed.